Sylmar Truck Accident Personal Injury Lawyers and Wrongful Death Claim Attorneys Are You Looking for Expert Legal Assistance for Your Sylmar Personal Injury Case or Wrongful Death Claim? Our truck accident injury lawyers and wrongful death claim attorneys in Sylmar, San Fernando Valley, Los Angeles and all of California possess more than 40 years of legal experience in providing expert personal injury legal services for those injured in a truck, car, motorcycle or any other kind of accident. We also extend our expertise pertaining to wrongful death claims to families and loved ones of people killed in fatal truck collisions in Sylmar and Los Angeles. 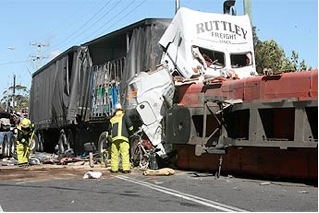 So, if you require aggressive yet supportive legal representation in your truck accident personal injury claim, contact our reliable and experienced lawyers for a completely FREE & CONFIDENTIAL CASE CONSULTATION & CASE EVALUATION. Our truck accident lawyers can assist you from the smallest and the simplest of things to the most complex matters pertaining to your truck accident case. Our lawyers take over all legal formalities of your personal injury case and even assist you to cope with traumatic injuries, including emotional and psychological injuries, medical care, hospital bills, damage to property, loss of income and other damages. You can depend on our personal injury lawyers for all rounded assistance during your truck or car accident personal injury case. To know more about our lawyers, feel free to check our lawyer profiles and our personal injury & wrongful death case testimonial pages. For more information on truck accident injury claims, including what should be and should not be done, please visit our Truck Injury Accident Web Site and learn more about the truck accident injury claims process. And for much more specific information about your own truck accident injury claim, please call us at 1-866 INJURY 2 or 818-222-3400 (after hours, dial “1”) or click here 24/7. About Sylmar, Los Angeles, Calif.
A moderately diverse neighborhood in the San Fernando Valley in Los Angeles, Sylmar was once known for its olive orchards since the 1890s. Olive production had just started in a systematic manner. The origins of Sylmar can be traced back to the 18th century when the San Fernando Mission was founded. Sylmar was always prided for its considerably healthy climatic conditions, and as a result a sanitarium was established, first in a series of hospitals established in the area. Today, there are fourteen (14) public and eight (8) private schools in Sylmar. During 2009, the Sylmar Chamber of Commerce estimated the population of Sylmar to be approximately 90,000 residents. Truck Accidents in Sylmar, Los Angeles, Calif.
A Sylmar truck accident is not only traumatizing but can cause physical and emotional injuries, and, in worst cases, even deaths resulting in wrongful death accident claims. It is often best to consult with a trained and experienced personal injury & wrongful death accident attorney. There are many time-bound procedural rules and deadlines to adhere to, thus seeking the assistance of the best personal injury lawyers will serve your family and you in your and their best interests. If you were involved in a truck accident or car, motorcycle or any other motor vehicle accident in Sylmar or anywhere in Los Angeles or California, we urge you to contact us now for an absolutely FREE INITIAL CASE CONSULTATION AND CASE EVALUATION. Our entire personal injury law firm concentrates in dealing with Personal Injury and Wrongful Death Claims – not divorces or other matters. Our attorneys have received numerous honors, including Personal Injury Lawyer of the Year and Personal Injury Law Firm of the Year, and selection to Top Lawyers in California. Contact us 24/7 quick and easy. Fill-out the details of your personal injury case in Sylmar or anywhere in Los Angeles, CA and our truck accident and car accident experts will get back to you in no time. We also work on a contingency fee basis on acceptable accident cases – Which means there is NO fee until you WIN!